Google+ launched the Embedded post this week and naturally the experiments started. But very few brilliant examples coming out …. except one! 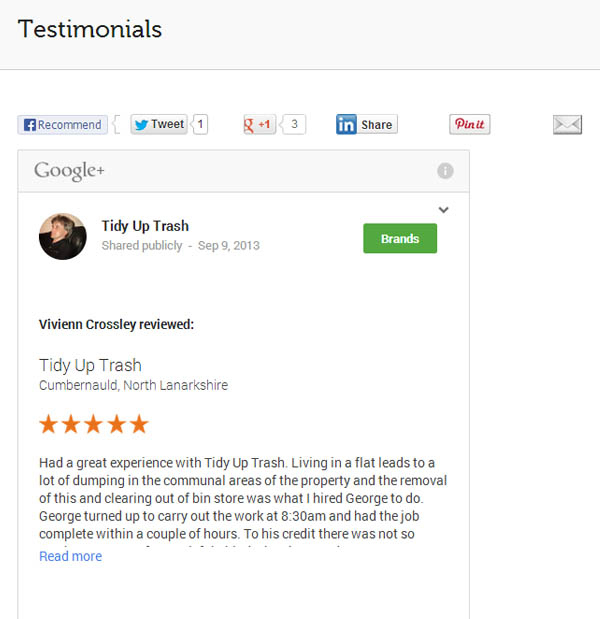 One local business called Tidy up Trash : www.tidyuptrash.co.uk put his thinking hat on and really nailed down embedded posts and in the true spirit of what google intended with embedded posts. George Buchan used some testimonials that people had written on his G+ page and embedded these onto his testimonials page. You can embed public Google+ posts in your site or articles with just a few lines of HTML code. Your signed-in Google+ readers can +1 or comment on your post directly from your site or follow the author. Use of embedded posts is subject to the Embedded Content Policy.